Hi there! 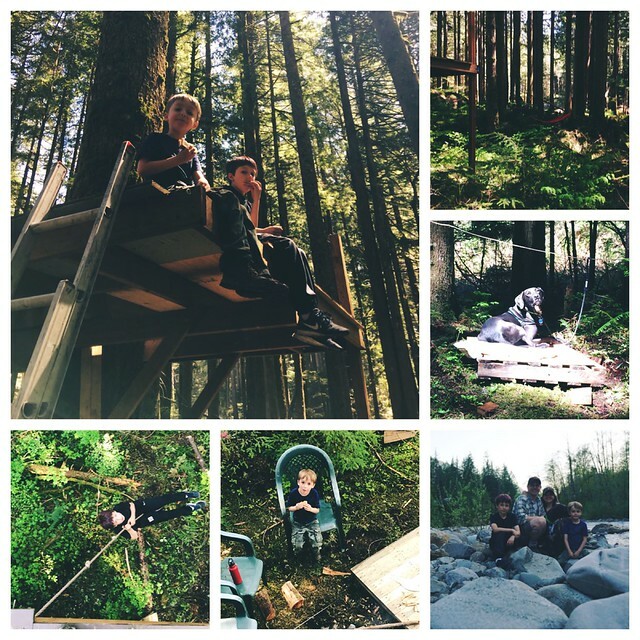 Have you gotten to go to the mountains to build a treehouse lately? I have! It's been so wonderful. First of all, on the Saturday before Mother's Day, we packed up our stuff and spent not just one meal but two meals out at the property. It was our longest visit yet. The weather is getting really nice, a bit hot some days, but I'm not complaining. We got there a little after 11am and stayed until after 7pm. They played, relaxed in the hammocks, walked to the river, and just enjoyed the property and the area around us while I worked. 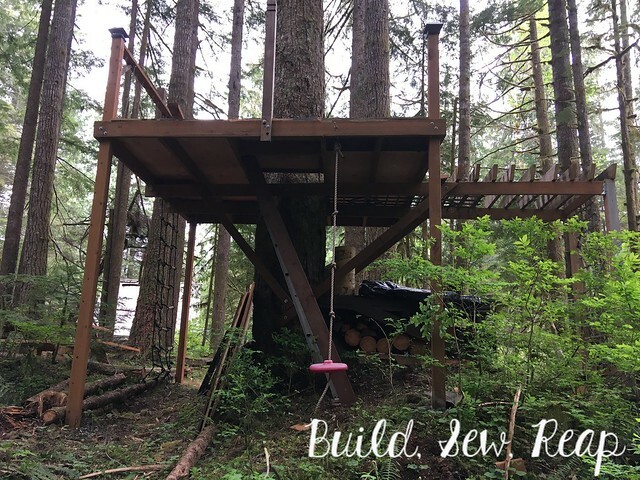 I'm perfectly content to build without help but it is really nice when Mr. BSR is out there too because sometimes I need a little extra muscle plus he's fun to hang out with. I didn't get a ton done that day as I was mostly spinning my wheels on just a few tasks but those days happen, it was still a glorious way to spend a sunny Saturday. I wasn't sure I'd get out during the week but then managed not one but TWO trips out without anyone else. On both Wednesday and Thursday, I had my tools unpacked from the back of the car and I was working hard by 10:15. One thing that really appealed to us about this particular location in comparison to our home was that we will often be traveling against traffic. I sped north on the highway as I saw nasty bumper-to-bumper traffic heading south both mornings. It was so invigorating knowing I was heading to the mountains, not sitting in traffic dreading my day. I didn't take a lot of pictures on Wednesday but I tried to take some parting shots on Thursday. I'll walk you through the progress so far. I took the above picture as I was leaving. 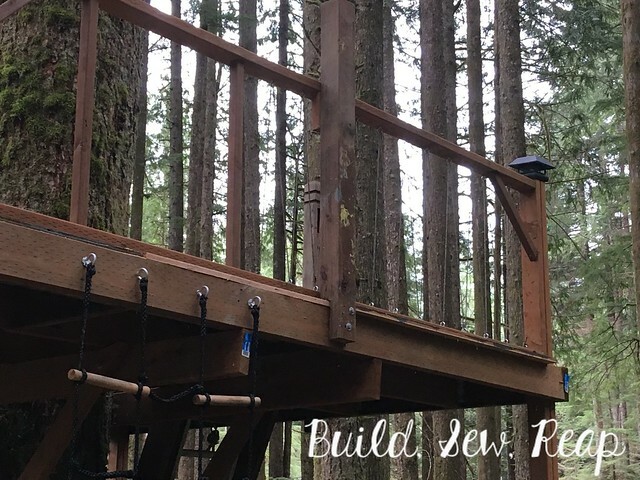 As you can see, I started on the railings, hung up the climbing net, added solar light post caps, a bucket pulley system, and more. I only have 2 of the 4 railings up but the wood is all up top, waiting to be secured. 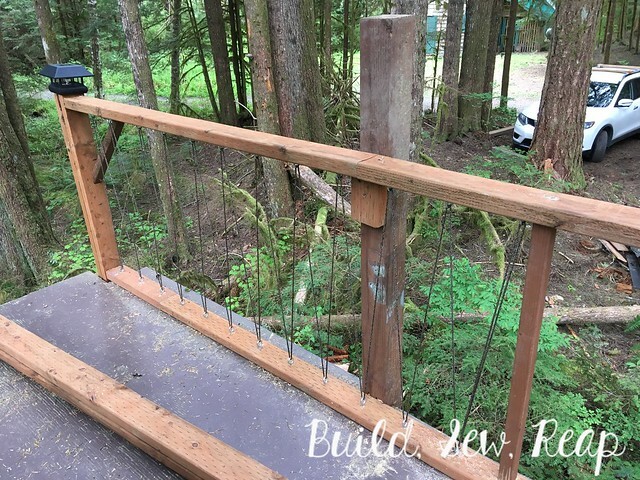 I'm using scrap pressure treated 2x4s for the railing as well as a base rail (not sure the technical term for that) but in an effort to keep it more open, I've added eye screws which I strung with camouflage cordage. It's really hard to see but that's kind of the purpose, isn't it? 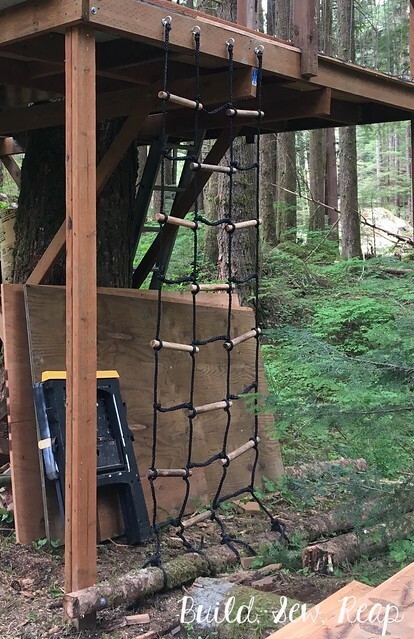 There are 2x2 posts on either side of the climbing net so the kids can get up and over the edge. This was something my brother gave to the oldest kiddo a couple of years ago for his birthday. We've tried putting it up in various spots around our home property and nothing had really worked out. 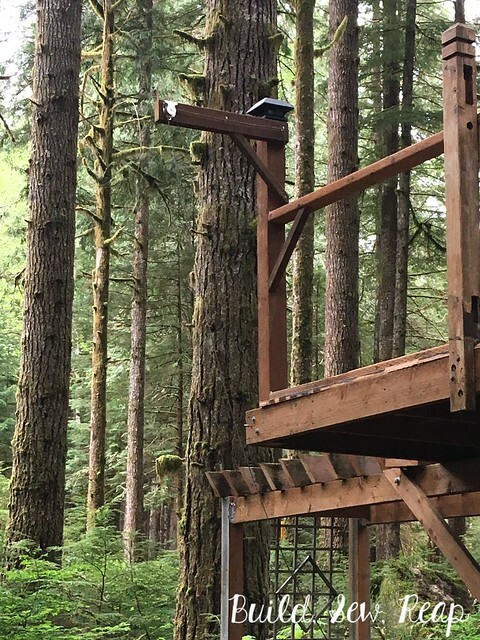 Boy is it ever perfect on the tree platform though. I'm so glad I was able to find all the installation parts and get it set up securely. 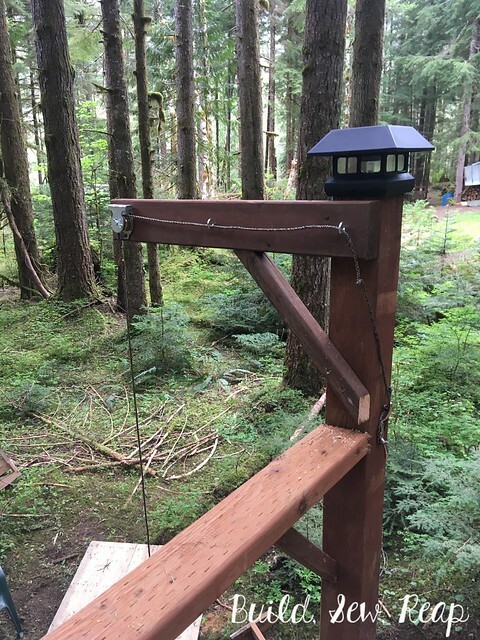 It's bolted to the top and then the bottom ropes are tied around a tree that's secretly bolted to the support posts. It's handy having all sorts of fallen trees to work with as I build. There I was, late in the evening, cruising Home Depot on Mother's Day when what do I see but a "bonus buy" sign and some solar post caps. YES PLEASE!! The only thing I love more than seating is lighting. I can hardly wait to be out there at night to see how they look. Looks like I might need to straighten this one a bit. The post cap picture brings me right to what will surely be one of our favorite features and that's the bucket pulley system. I don't have a crank for it (yet) but if you don't put ALL your tools in the bucket (ah hem), it's quite easy to manage. I need to find us a better bucket or basket or something because the cat litter bucket isn't the prettiest thing. I think it would be nice to have something that drains and won't hold dirt too, a wire basket maybe. Hmmmm.... I have some hardware cloth. PROJECT! This was another unloved toy from the home back yard. When you have 2 little boys, a multidirectional swing is a terrible idea. This disk came with our play set but I never figured out how kids wouldn't run into one another if this was hung up anywhere near the regular swings so in an attempt to avoid collisions, we never hung it up. 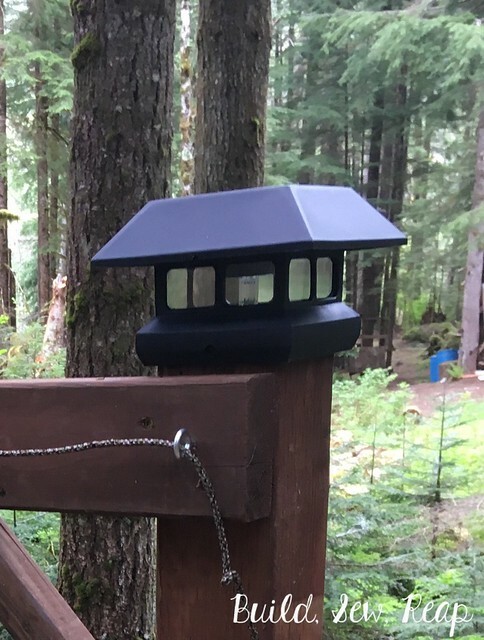 Well, once I realized it would be perfect out in the forest, I installed it off the back side. 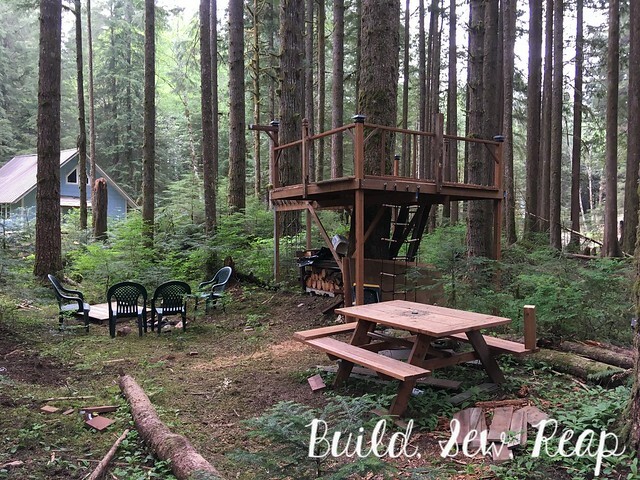 I'd actually like to figure out a way to make it hang out from the structure more but for now, it's there and the kids can swing out over the gulch a little bit. This was a big part of yesterday's work. I still haven't taken the generator out to the property so most wood cuts have either been by hand or with the chainsaw. Yesterday I was surprised to find I could cut through 2 1/2 feet of plywood pretty quickly with my Irwin saw (affiliate link). That thing is a beast! So, I had to cut the plywood down not once but twice. 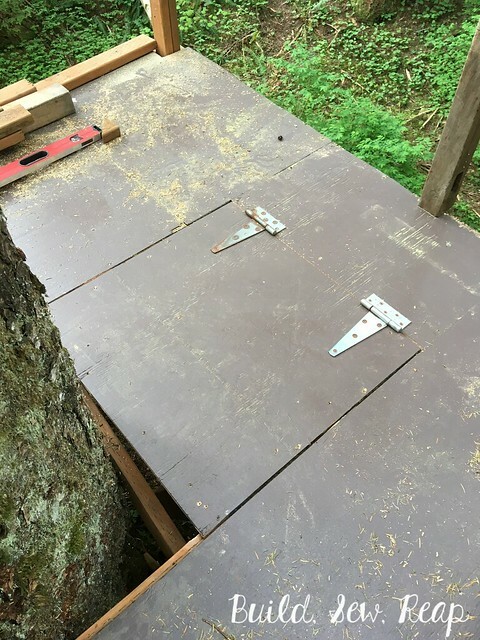 It was originally a very tight fit but I had to cut once to make it a door and a second time to ensure the door would open and close, even in damp weather when the plywood would swell a little bit. 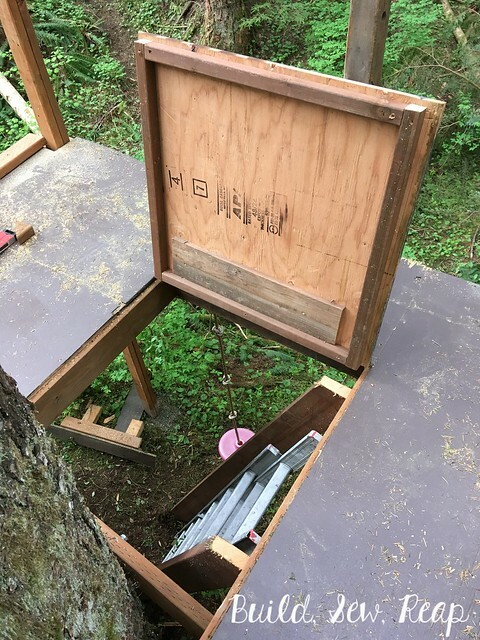 The hatch and ladder-to-be are on the back side which will likely create a problem for the swing placement but I like that we don't have to look at the ladder from the fire pit side of the setup. I wanted it a little hidden away. I may end up switching the direction of the ladder though. The more I think about it, the more I think perhaps it should attach to the opposite side of the hole. Either way, I did manage to cut some really precise angles without actually measuring them. I did a lot of marking parallel lines and it worked. I was elated when I made the cuts and leaned the side-beams in place. I'll be adding treads on our next visit out, hopefully tomorrow. Yippee!!! I think that's it for now. I'll leave you with a picture I took from the car as I was leaving. I absolutely love this (although, to be honest, it takes a certain amount of focus to ignore the stack of materials under the black plastic in the foreground; that stuff will be used up soon). 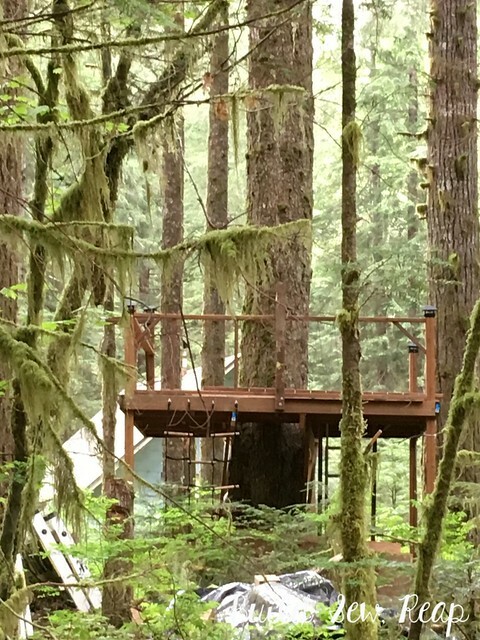 Have you ever built a treehouse or a tree platform? Do you have any suggestions for features I should add? It looks A-MAZING! Not that I had any doubts, but it looks way better than even what I was imagining. You are so good at what you do! !